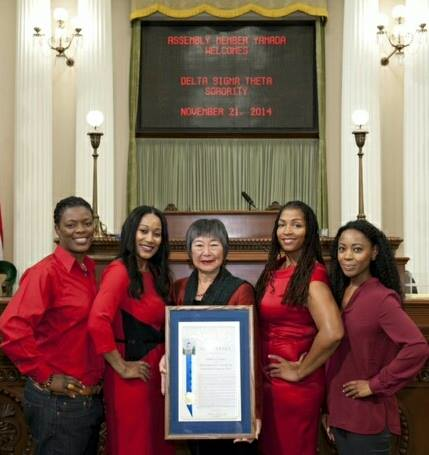 Assemblymember Mariko Yamada presented her final resolution on the Assembly floor to the UC Davis Chapter of Delta Sigma Theta on Nov. 21. SACRAMENTO — Former Assemblymember Mariko Yamada (D-Davis) has wrapped up her third and final term. Yamada, who has represented the 4th Assembly District since 2008, cannot seek re-election again due to term limits. She is preparing to run for the 3rd Senate District seat currently held by Democrat Lois Wolk, who will be termed out in 2016. Her successor, Bill Dodd, was sworn in on Dec. 1. Yamada and her team, dubbed the “Yamada Armada,” turned in their badges and keys before Thanksgiving, although the official last day was Nov. 30. “My little Honda Civic Hybrid has gone from 29,000 in 2011 to today’s 101,001 miles crisscrossing the big, beautiful, complex and diverse 4th Assembly District,” she wrote. “Thanks to American Canyon in Napa County and Woodland in Yolo County for hosting our district offices these past two years, and to all the jurisdictions we have been privileged to represent since 2008. To celebrate her 40 years in public service, 20 of them in Davis, Yamada held a “sayonara” event on Oct. 12 at the Davis Senior Center. Yamada noted that the Nov. 4 election marked the first time in a dozen years that her name was not on a ballot. She served on the Yolo County Board of Supervisors from 1999 to 2003. She has also worked for the U.S. Census Bureau, the San Diego County Department of Social Services, and Los Angeles County Supervisor Ed Edelman, among other positions. She received her MSW from USC in 1974. She also pointed out that with her departure, and Democrat Al Muratsuchi’s unsuccessful bid for re-election in the 66th Assembly District, there are no Japanese Americans in the Legislature. “Keiro no Hi” is “Respect for the Aged Day,” a national holiday in Japan. Aging and Long Term Care: AB 40 (2012) and AB 602 (2013) — Streamlines and strengthens reporting of abuse, neglect in state-licensed facilities and institutions caring for the elderly and people with disabilities. AB 292 (2009) and AB 394 — Extends voluntary tax contributions for Alzheimer’s research through the year 2020. Veterans Affairs: AB 557 (2013) and AB 1729 (2010) — Increases transparency in reporting residents’ cost-of-care in California veterans homes (there are eight in the state) and extends eligibility for state employment for qualified veterans from six to 12 months. Agriculture and Water: AB 1965 (2009) and AB 1165 (2009) — Clarifies Williamson Act adjustments and “cleans up” issues arising from the 2007 comprehensive flood protection package. Labor and Civil Rights: AB 1006 (2013) and AB 1964 (2012) — Standardizes statewide the conditions under which juvenile court records may be sealed and/or destroyed upon successful completion of sentence, and establishes the highest workplace religious freedom standards in the country. Consumer Protection: AB 647 (2009) and AB 999 (2012) — Requires the DMV to comply with the National Motor Vehicle Title Information System, and establishes standards for the premium rate-making process for the private long-term care insurance industry in California. AB 511 (2012) and AB 1623 (2012) — Requires developers of wind energy to comply with all federal standards for siting of MET (meteorological evaluation towers) in rural areas, and strengthens the investigation and enforcement authority for county agricultural commissioners. Elections: AB 413 (2011) and AB 1626 (2012) — Establishes an all-postal ballot pilot program in Yolo County, and strengthens the authority of county elections officials in reviewing title and summary of ballot measures. Animal Rights: AB 1965 (2014) -— Standardizes and makes permissive the opportunity for “Dining with Dogs” in outdoor seating areas of California restaurants unless a local ordinance prohibits the practice. Memorials and Resolutions: ACR 14 (2013) — Establishes the Tony Diaz, Yolo County Sheriff’s Office Memorial Rest Area; ACR 21 (2009) with Assemblymember Warren Furutani and ACR 85 (2014) with Assemblymember Muratsuchi — Recognizing Feb. 19 each year as “Day of Remembrance” and the significance of Executive Order 9066 in California.